I finally saw Rogue One! 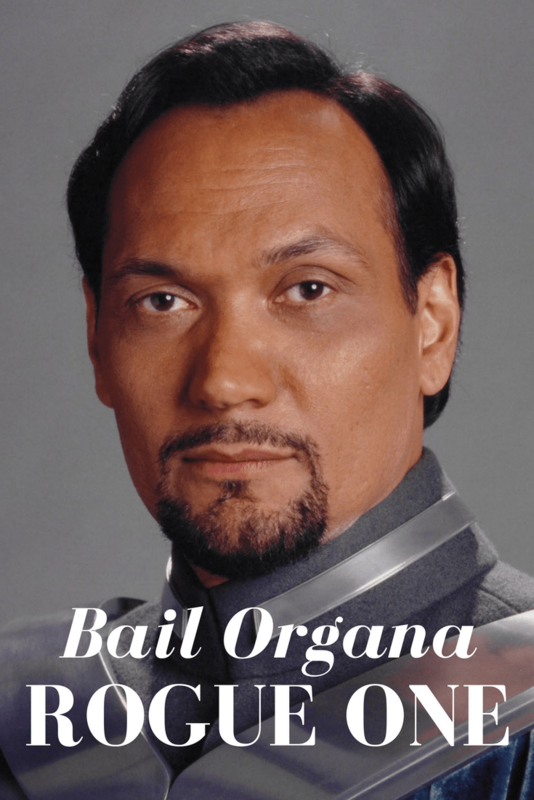 Jimmy Smits as Bail Organa, as predicted, was awesome! Update, Smitizens! I have seen the movie! Okay, Bail Organa didn’t say, “This party is over! I’m going back to Alderaan where nothing can hurt me!” But he did say something along the line of, “Captain Antilles! I have a job for you!” as he sort of walk-jogged to an off-screen Captain Antilles. And the job was to find Obi-Wan, not carry the Death Star plans. So, that was interesting. First off, who is Captain Antilles? He’s the Captain of the Tantive IV, the ship that the Star Destroyer is chasing at the beginning of Star Wars. And Captain Antilles is Darth Vader’s first on-screen kill, a moment forever burned into my mind when I was 7. Vader lifts Antilles up by the throat and throttles him while saying,“If this is a consular ship, where is the ambassador?” That must have been a super weird last thing to hear. Just a random thought? Maybe that’s the moment where Darth Vader tired of manually choking people and decided to start Force-choking? We see him choke like five more guys, but always with the force. So thanks a lot, Bail Organa, you got Captain Antilles killed! Well, for the cause, I guess. But to take this seriously for a moment, Jimmy Smits nailed the role. Bail Organa seemed just the right combination of smart and convincing, and showed where Leia learned some of her diplomacy. I really thought that Bail Organa, unlike, say, Dr. Evazan, really brought something to this movie, showed that the Star Wars universe can hold together and that characters from the prequel trilogy can work in the new Disney world. Is Smits King Organa? Leia’s a princess. It sort of clocks. Do you still think of Bobby Simone every time you go to the dentist? Whenever you meet a lawyer, are you secretly figuring out which LA Law character they most resemble? Did you think that Matt Santos was going to be a much better president than that blowhard Jed Bartlett? Was Cane cancelled far too soon? Is your favorite fictional serial killer not Dexter, but his buddy, ADA Miguel Prado? If so, perhaps you are a Smitizen, one of the hoard of Jimmy Smits fans who recently had all their dreams realized when it was announced that Bail Organa is in the next Star Wars movie, Rogue One. Bail Organa is, of course, the adoptive parent of Leia Organa, aka Princess Leia, aka the Skywalker twin who always got the best stuff. Compare Luke’s parents, who were jerks who live in desolate squalor, to Leia’s parents, who are royalty who live in a palace and want nothing more than the love of a child. Leia married Han Solo, the coolest guy in history. Whereas Luke joined a monastic celibacy cult. Bail was also buddies with Yoda and Obi-Wan Kenobi, enough so that they trusted him with a baby that they knew would grow to be strong in the force. Bail’s part in the prequel trilogy is basically, “Oh, hey, Yoda. How are you?” and then someone hands him a newborn baby and he gets in a speeder with no car seat. But of course, Bail is Jimmy Smits, so he nails the part with a down-to-earth, devil-may-care attitude and debonair good looks, rocking capes, fuzzy vests, and a huge metal necklace that even Worf would have thought impractical. In one scene, Bail has the greatest turtleneck in the history of the garment, one that would have choked a lesser man than Jimmy Smits. And let us not forget, he has the galaxy’s best goatee. Say what you want about the prequel trilogy, but George Lucas is a man who knows how to dress up a faux-16th Century dandy. Okay, first off, let’s temper our enthusiasm. I don’t think Bail is going to be in Rogue One very much. Smits himself has called the role a cameo. However, I, for one, had always wondered how involved the elder Organas were in the illegal rebellion against the lawfully elected Empire. If we get even a glimmer, I’ll be pleased. Best case scenario, Bail will have a hilarious, memorable line, “Now that these Death Star plans have been stolen, I’m going to back to Alderaan where it’s safe!” Worst case scenario, his scene is cut before the movie is released. There is one great thing about all this, it’s proof that the prequel trilogy is not verboten at Disney. There has been an implication in a lot of the talk about the new Disney Star Wars that they were going back to what made Star Wars Star Wars, aka the original trilogy. But there was some great stuff in the prequel trilogy, like Jimmy Smits, of course, Darth Maul, Ewen MacGregor’s Obi-Wan, Palpatine and Goddamn Qui-Gon Jinn. I wrote an article about how I don’t think anyone is ever going to say “midi-chlorians” ever again in a Star Wars movie. But let’s not throw out the good with the bad. I think whoever did character design in the prequel trilogy deserves a Nobel Peace Prize. Darth Maul? General Grievous? Those guys look awesome. Anyway, the most important thing, for me, about this small piece of news, is that if the prequels are still in play, then maybe we will finally get the Ewen MacGregor Obi-Wan movie. Or we get a movie explaining the still murky specifics of the trade federations taxation of trade routes to outlying star systems dispute. Kidding about that second one! The way this article is going, even I can’t tell when I’m being sarcastic. I do like Jimmy Smits. And I love Star Wars and am really looking forward to Rogue One. I guess there is something funny about how every little piece of news is picked up by all the web sites I’ve looked at, including what is probably a small moment with Bail Organa. In other words, I don’t think there is any other context that Media Medusa would be writing an article about the next Jimmy Smits movies (A sequel to the Jane Austen Book Club!). Anyway, Smitizens unite! Jimmy Smits is back in Star Wars! Thanks for reading! Get our free Guide to 75 Binge-Worthy TV Shows when you sign up for our newsletter.